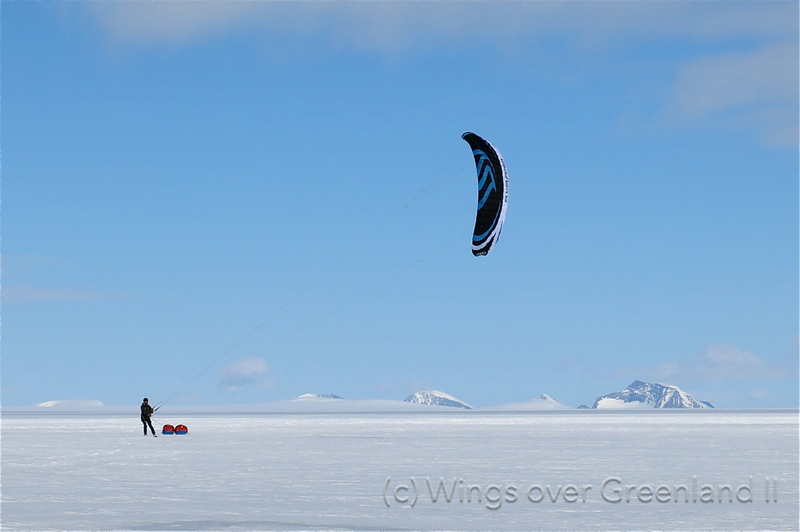 floating around in the small community of polar kiters since some time already. 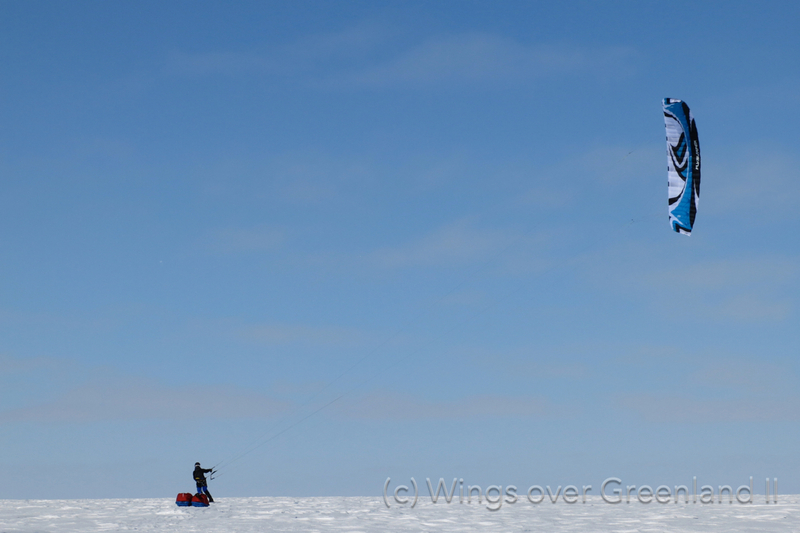 navigation and simply the longest journey on skis in full autonomy - ever. 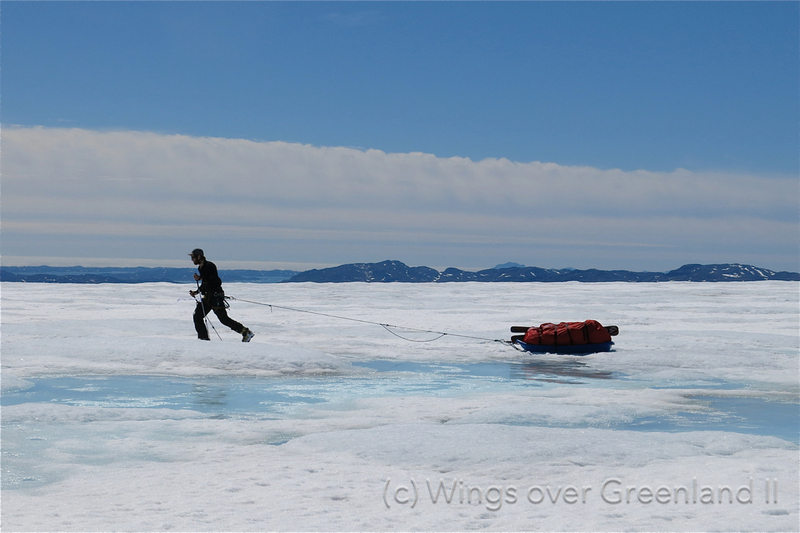 Mid June, we were ferrying our equipment down the bare ice and the steep rocky moraines towards Qaleraligd Fjord, where we had started a little less than two months ago. 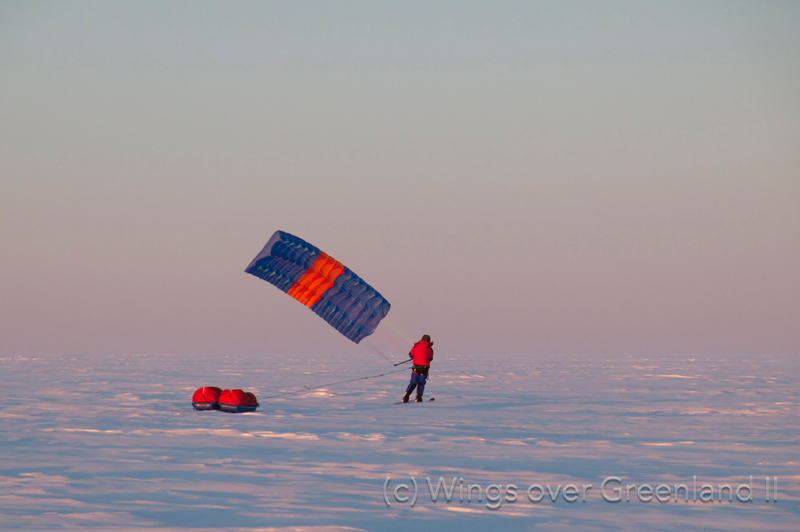 When we reached the shore again after 58 days out on the ice, a dream had come true: we had just closed the loop and completed a circumnavigation of the Greenland Icecap by kite and ski relying mainly on katabatic wind systems for our progression. an elevation of 2900 m at the East-Col, nearly 20 degrees of latitude - and back. 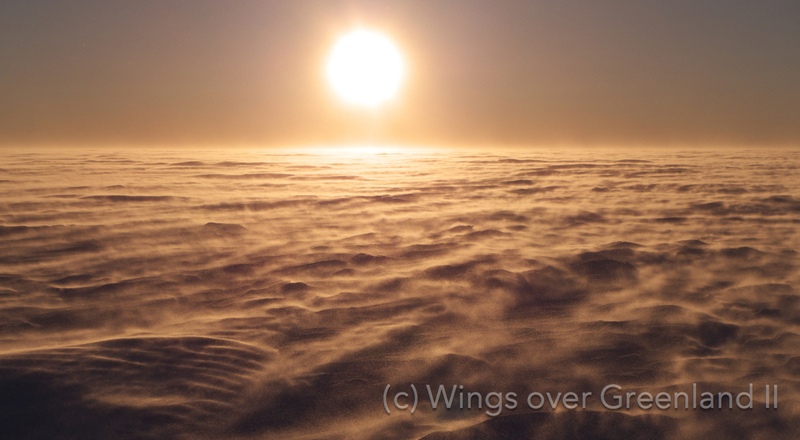 Our journey enclosed more than 50% of the surface of the Greenland Ice Sheet. 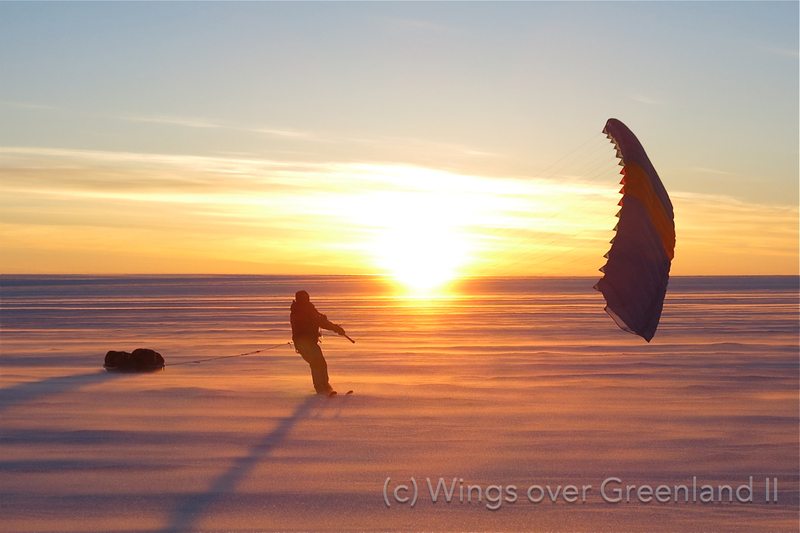 The idea to circumnavigate the entire Greenland icesheet by kite and ski was hovering around in the small community of polar kiters since some time. Already the Norvegian team pioneering the route from Narsaq in the south to Qaanaaq in the north on skis in 2005 gave it a thought to return all the way back home. 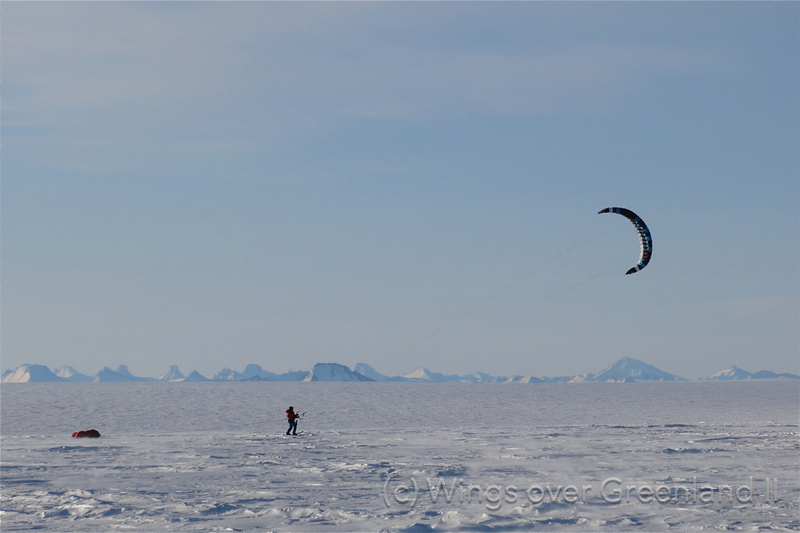 Once a few more teams (including us) had successfully repeated this trip, the possibility to efficiently use katabatic wind systems for long distance kiting in Greenland was taken for granted. By extrapolation, it appeared only logic, that a circumnavigation of the entire icecap should be possible. limited visibility, starkly contrasting the perfect blue sky above. And as is often the case with good ideas, several teams were considering to give it a try. 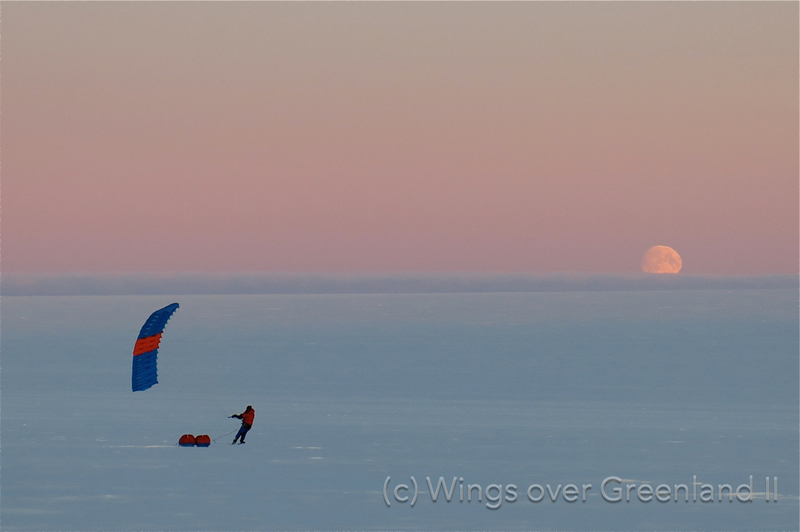 For the circumnavigation of the Greenland icecap, this is no different. Yet it took some time of thinking, tinkering and preparation, until somebody made a move. 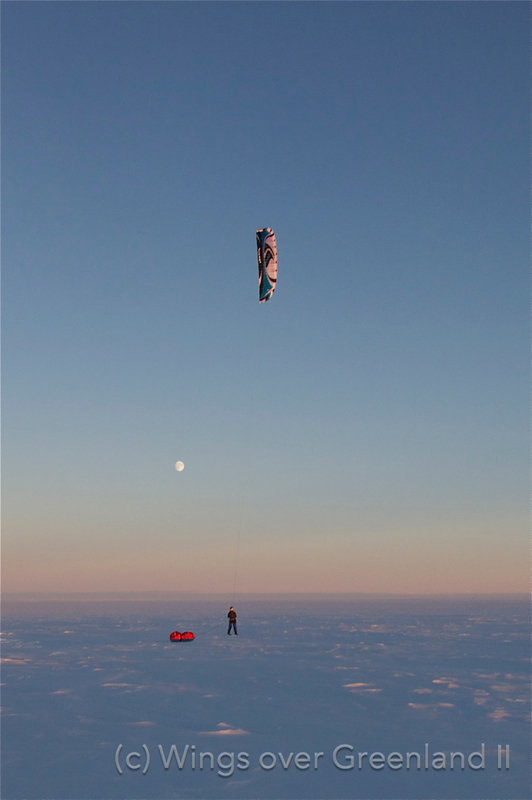 But finally this year not one, but three teams announced that they would attempt the first circumnavigation of the Greenland Icecap! 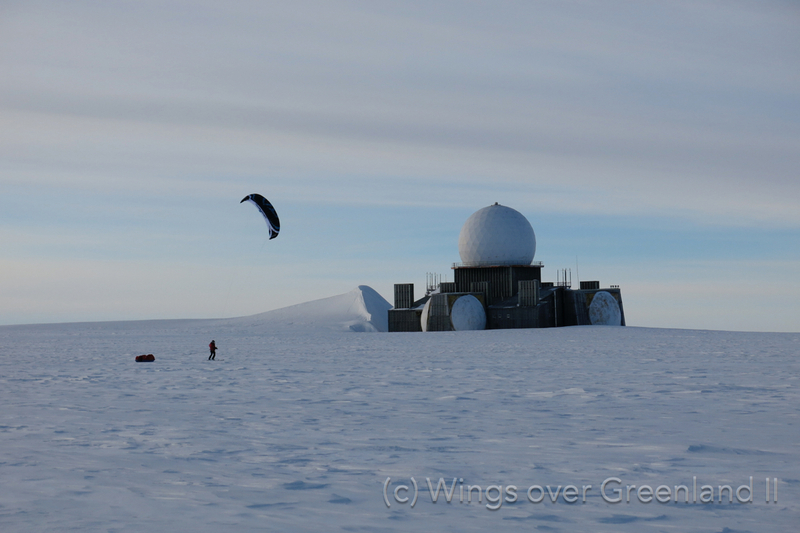 Dixie Dansercoer and Eric Mc Nair - Landry with "Greenland Ice 2014"
Ramon Larramendi, Hugo Svensson, Karin Moe Bojsen, Manuel Olivera and Eusebio Beamonte with "Trineo de Viento / Inuit Windlsed"
and ourselves with "Wings over Greenland II". Make sure to visit the websites of the other teams! construction on long lines to get going in the lightest breeze. 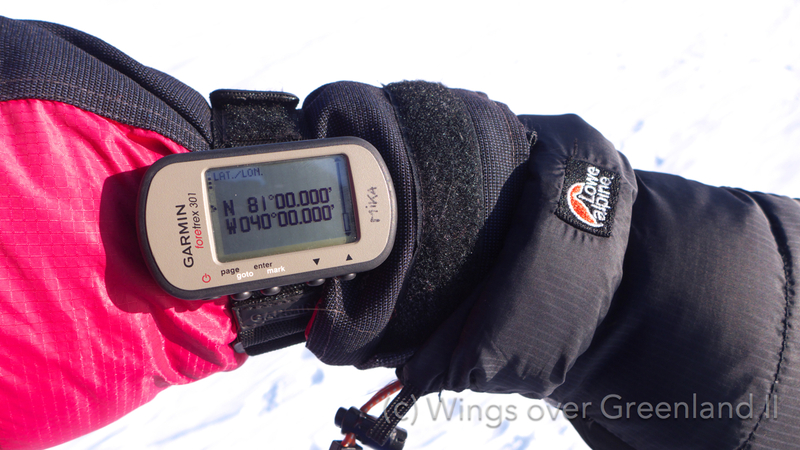 During our journey we covered a total of 5067 km at an average pace of 87 km per day. This is actually longer than a trip from Paris to Moscow and back! And also more than the 5013 km covered by Dixie Dansercoer and Sam Deltour in their attempt to circumnavigate East-Antarctica in 2011-12, which by then had beaten the previous record of 4804 km established by Rune Gjeldnes during his Antarctic crossing in 2005-06. 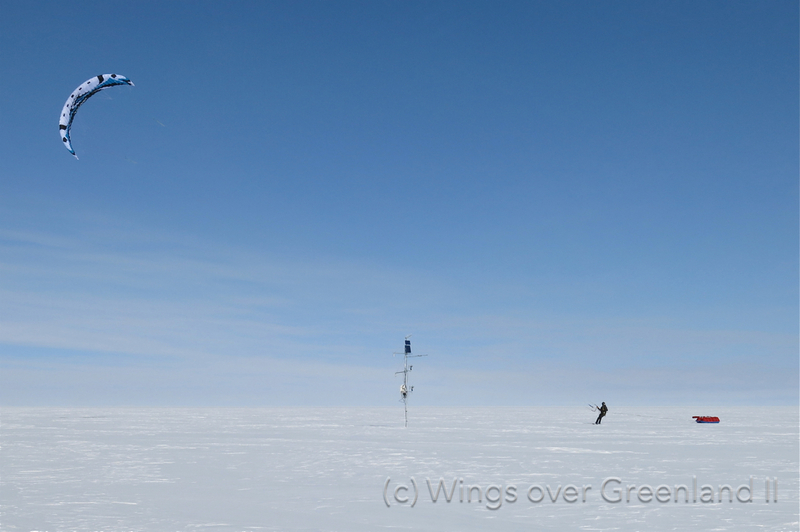 At the time of writing, Wings over Greenland II is the longest trip on skis in full autonomy ever! 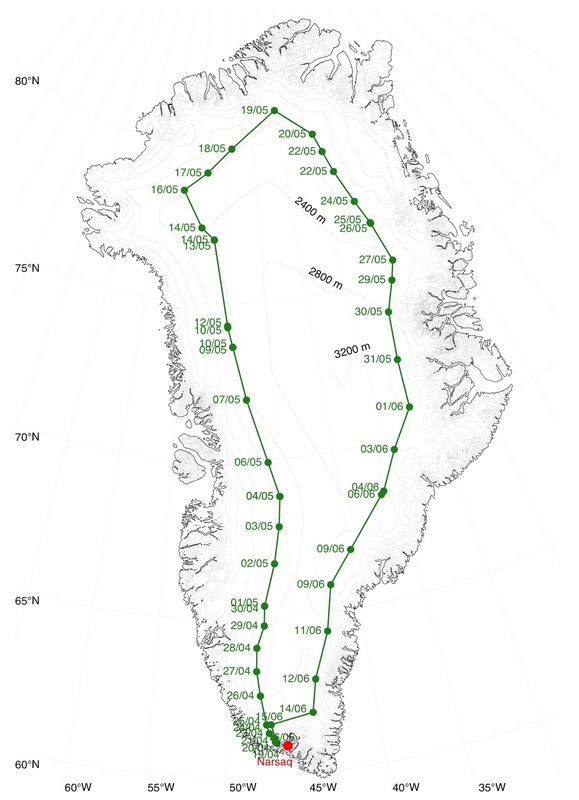 And enclosing more than 50 % of the surface of the ice sheet, our round trip is the most complete circumnavigation of the icecap as of today. Forel on our way back south. When we had left Narsaq barely two months before, the village was still wrapped in snow, and we had started our trip on the sea ice that beset the last kilometres of Qaleraligd Fjord. Back then, the same steep moraines terminating the glacier over which we hauled ourselves and 360 kg of equipment from the shore towards the Icecap were deeply covered in snow, and its crevasses safely plugged. What a change on our way back south! Soon after crossing the east col, the lowest passage between the 'Summit' and Mount Forel, and at 2900 m elevation the culminating point of our voyage, hesitant signs of surface melt appeared as a light shimmer in our tracks. They quickly developed into vast expanses of fast firn that made for a pleasant change in skiing. 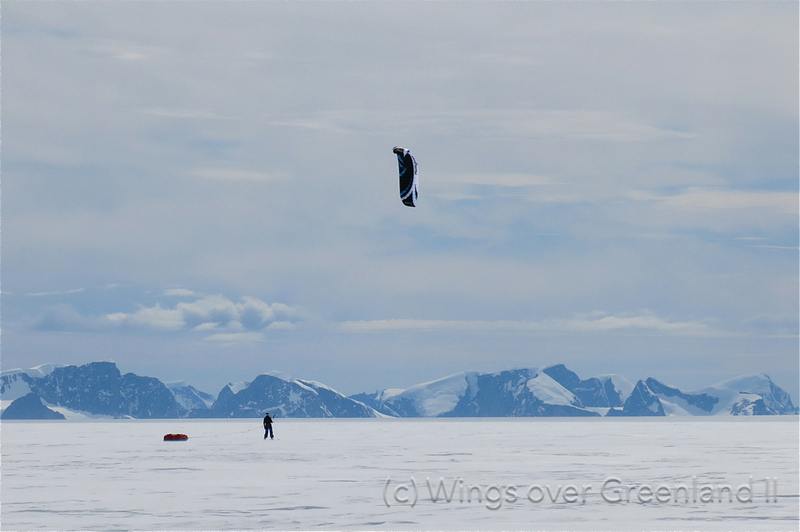 Descending further in latitude and altitude saw us kite through deep slush, doubt the resilience of countless snow bridges covering abysmal crevasses, and navigate through mazes of blue melt puddles and grey ice pimples. 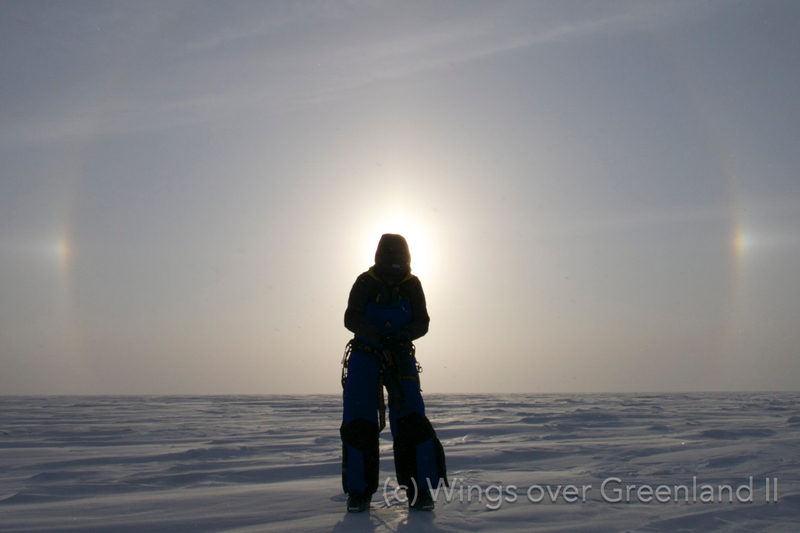 We finished grinding our way down the dirty, hummocky ice, meandering between open cracks, melt water channels and cryoconite holes. And in the very end, we had to laboriously ferry the remaining equipment over the steep moraines devoid of snow down to the blank rocky shore, where we had started two months before in an immaculate winter landscape. To our pleasant surprise, Narsaq now welcomed us dressed in vibrant green. our equipment over steep moraines devoid of snow down to the blank, rocky shore. surprise to find the village dressed in vibrant green upon our return. covering abysmal crevasses and navigated through a maze of blue melt puddles. At the same time, our journey took us over nearly 20 degrees of latitude. Starting over five degrees south of the arctic circle we travelled from our usual diurnal rhythm of day and night into the realm of the midnight sun - and back. Trying to catch any breeze of wind we often kited at night. In the beginning we remember sailing through pitch black darkness with the cone of our glaring headlights fasciated by the horizontally falling snow. Heading north we later first saw the sun setting just a little to the left of our heading, to re-appear only shortly after a little to the right, before we finally could enjoy skiing right into the orange glow of the midnight sun. On our way back south, we gradually travelled back into a rhythm of night and day. With the midnight sun in our back we were now chasing our long shadows before they left place to twilight with its pastel colours. When finally hesitant night set again with shades of purple and gorgeous moon-rises, we knew that we were approaching our departure point far in the south. the sun is at its zenith, is slightly shifting with our position in longitude. successively fade in a twilight with hues of pink and blue. undulations in shades of pastel colors. 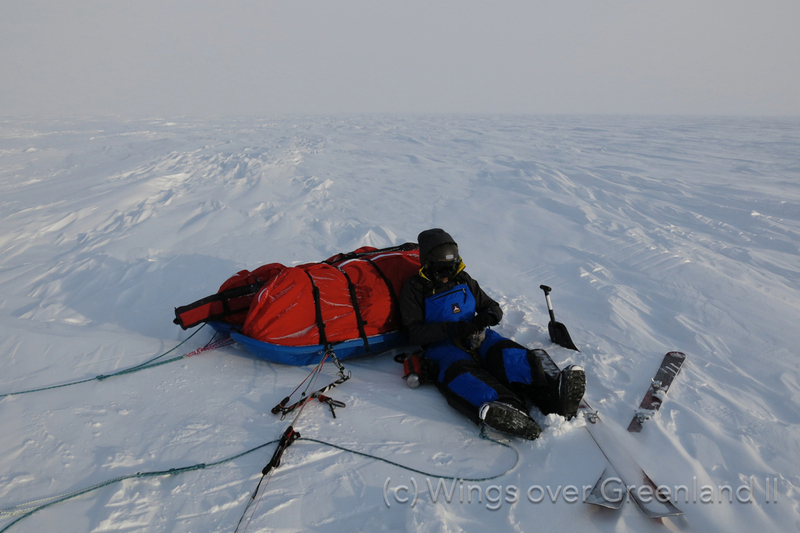 The gigantic trip around worlds largest island and second largest ice sheet is before all an endurance challenge. Physically, technically, and mentally. Being continually on the move for this long, making and breaking camp nearly every day is physically exhausting. 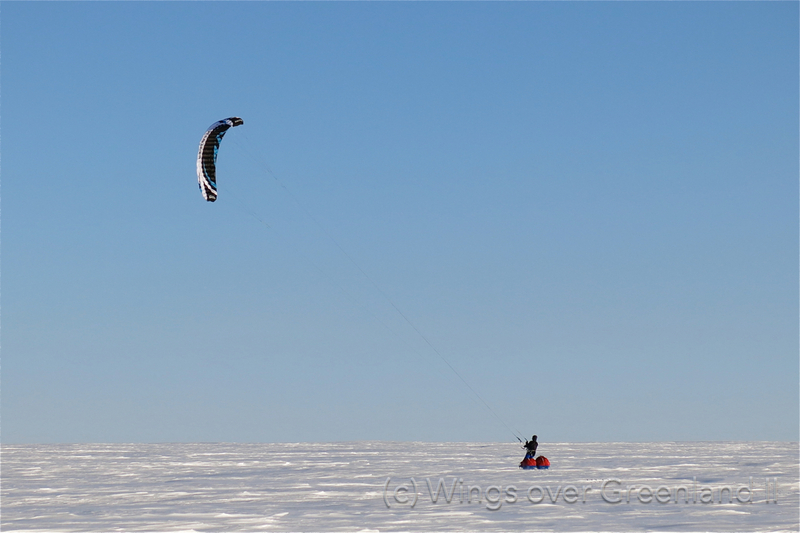 Permanent exposure to the cold and kiting through thousands of kilometres of sastrugis and rough surfaces requires to constantly hold balance between the urge to progress and the strain on the body, knowing that there is little hope to cure injuries and to recover from deep exhaustion. Weight limitations only allow for limited redundancy in the technical equipment. We thus had to maintain and repair our gear, in order to withstand the wear and tear of hundreds of hours of kiting, camping and cooking. 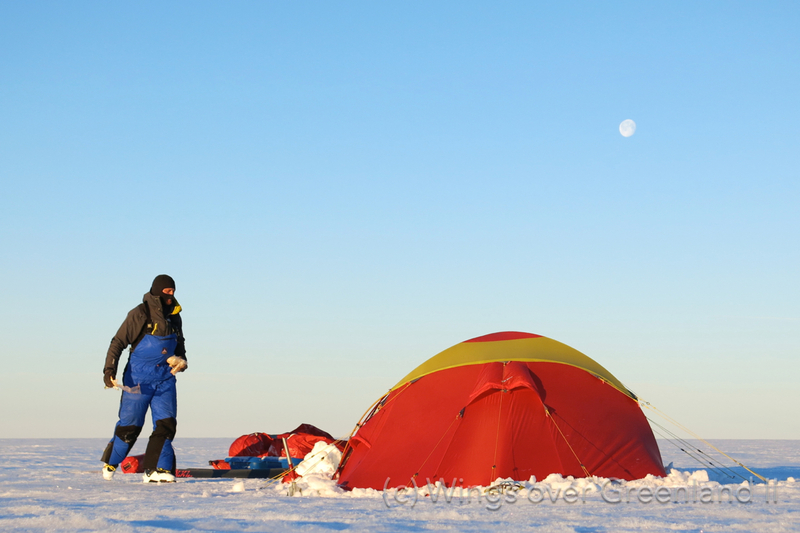 largest island and second largest icecap is most of all an endurance challenge. dressed up for a cold night on the icecap. We were rather free in our choice of route as long as we would stay high enough to avoid melt water lakes and channels, crevasses from glaciers draining the icecap towards the coast, low enough to benefit from katabatic winds, and make our way at least around the summit of the icecap and back. We found it a futile diversion to pass at the abandoned radar station 'Dye2', home-in on the automated weather stations 'Nasa-U' and 'Humboldt-Glacier', and to chase down the 'confluence' of the latitude 81 N and meridien 40 W as our northermost turning point. Yet one of our biggest surprises were not traces of human civilisation. 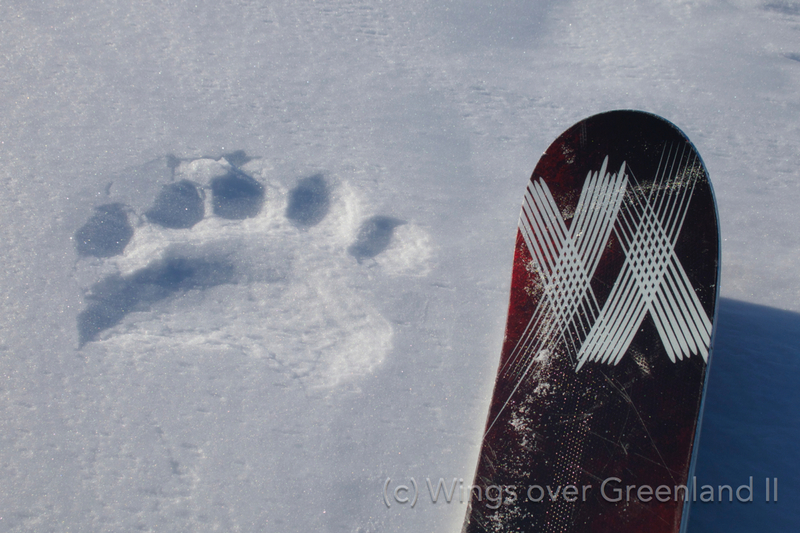 Far in the north-east we had the unlikely chance to cross polar bear tracks - more than 200 km from the coast. And further south again, we thoroughly enjoyed the incredible view on the impressive mountain ranges separating the icecap from the eastern shores. radar station Dye-2, A relic of the cold war. Traces of civilisation: homing in on the automated weather station 'Nasa-U'. weather stations to understand the wind systems. our rather fat Voelkl Mantra skis suddenly appear narrow in comparison. delicate side to side with these paws. panorama suddenly unfolded to our left. The long journey is not only characterised by the uniformity of the effort, but also by the apparent monotony of scenery. But, although imperceptible on the time-scale of direct observation, the ambiances were constantly evolving! Each day, the surface was different. We had days of hard, icy snow, surfaces plane as a mirror with a velvet cover, gently undulated dunes of packed snow, dry powder, molten firn, and of course: lots of sastrugis. And even though dreaded for skiing, they come in a multitude of fantastic shapes with a particular artistic unity due to their common principle of formation. 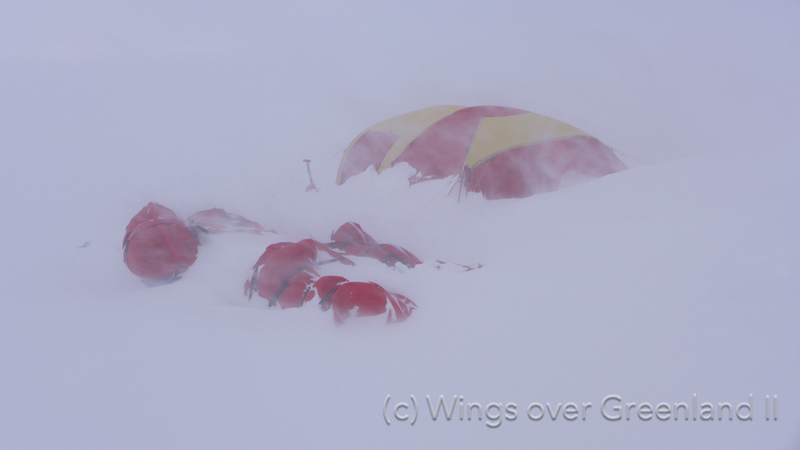 Being our motor for all but a few kilometres at the start and in the end, we were ruled by the wind. 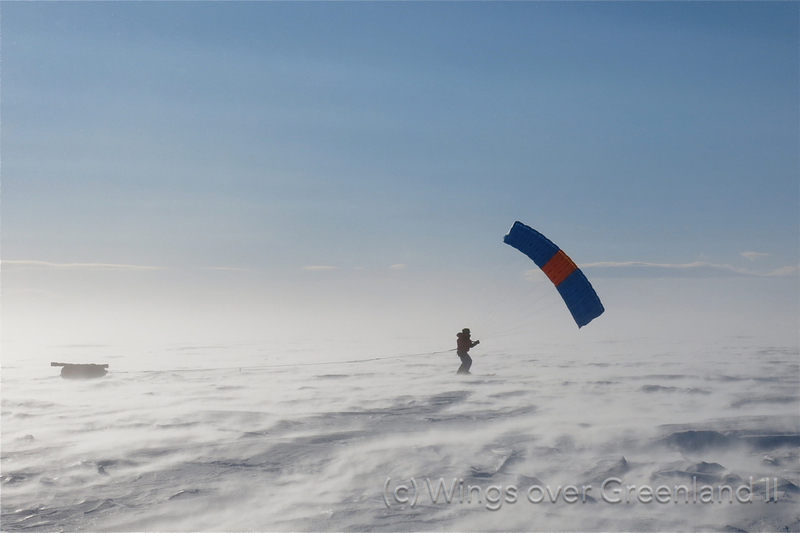 And although, the expedition was designed around the strong link between Greenland’s topography and the katabatic wind systems, each day was very different. We therefore often were enjoying the wind three quarters in the back, or from the side, but occasionally we would have to tack downwind not to outrun our kites and to keep them inflated, and on rare occasions we earned a few hard kilometres tacking right upwind. On some days we had difficulties to harness the almost imperceptible breeze with our biggest kites on long lines, whereas on others we had a good wrestle riding the wake of a storm with our Beringer Skisails with their short bridles. Adding to this the incredible lighting with the sun often sweeping low over the horizon makes for an infinite variety of different atmospheres. And when the degrees of latitude passed slowly and the kilometres accumulated laboriously, these wonderful ambiances were our biggest reward. laboriously, these wonderful ambiances were our biggest reward. We would like to acknowledge our equipment sponsors Flysurfer Kiteboarding, Snowsled Polar and our media partner, the french magazine 'Carnets d'Aventures'. Many thanks to our routers, the home team, and for the support and donations from our friends, families and followers. Without you, this journey would not have been possible - our achievement is also yours!